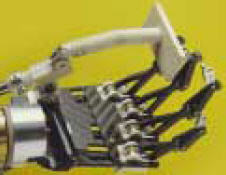 The Southampton Remedi-Hand is a a myoelectrically driven device (control signals are derived from a flexor tensor muscle pair) with independently driven fingers and a two axis thumb allowing the hand 6 degrees of freedom. The palm of the hand and fingers are made of a light weight epoxy carbon fiber making the total assembly weight less than 500g - even lighter than a real hand. "With this hand you can clutch objects such as a ball, you can move the thumb out to one side and grip objects with the index finger in the way you do when opening a lock with a key, and you can wrap your fingers around an object in what we call the power grip – like the one you use when you hold a hammer or a microphone." The Southampton Remedi-Hand also features a remarkably advanced feedback control system. 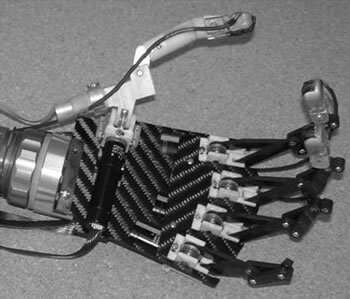 Most prosthetic hands lack any intelligent feedback control system, requiring the user to rely on visual feedback to detect whether an object is slipping out of the hand or if an unnecessarily large force is being applied. The Remedi-Hand uses screen printed thick film piezoresistive resistors and piezoelectric dynamic sensors to provide a cheap and compact solution for detecting grip force and slip of an object from a prosthesis. The Southampton Remedi-Hand uses a new type of fingertip that allows direct screen printing of thick-film sensors onto the surface. The fingertip has an array of thick-film sensors deposited on it to both measure the grip force exerted by the independently driven fingers and also to detect the onset of slippage of an object held in the hand. Two types of sensors used: piezoresistive thick-film sensors arranged to detect the force on the finger and piezoelectric thick-film sensors to detect the onset of slip. Dr Chappell stated that "the aim is to create a hand with the sort of functionality a human hand has but also a sense of touch. This will let the hand know how tightly to grip an object like a coffee cup without dropping it, but not so tightly that it's crushed. It'll also have an integrated slip-sensor which will tell the hand if something is beginning to slip out of its grip so it can grip slightly harder. It'll be quite a clever system." Science fiction fans have been looking at very shiny robotic hands for a generation now, starting with the prosthetic device given to Luke Skywalker in Star Wars and the endoskeleton arm provided to Governor Schwarzenegger in the Terminator movies. If all goes well, the Southampton Remedi-Hand will be better than even Hollywood imagined. Read more at the press release.